This book is an incredible resource for any reader to get a glimpse into the future and to reflect on the recent past with astrological insight into not just the year ahead but two more years on top of that! Readers will have all their astrology needs set through the end of 2019 so they can look way ahead and also look back in an incredible three year period. Trish MacGregor - well renowned astrologer and author of the late Sydney Omarr horoscope books, as well as Page Street’s Secrets to Scorpios takes each sign through the year with month by month overviews of the moon and planets’ movements and how they’re likely to impact you. She will tell you to sit back and relax as the stars shine in your favour, or to get ready for challenges in your love life, finances or creative endeavors, as well as how the stars may impact your moods and more. The book is a must have for anyone who follows astrology and wants an unparalleled look at their lives or the lives of people close to them. 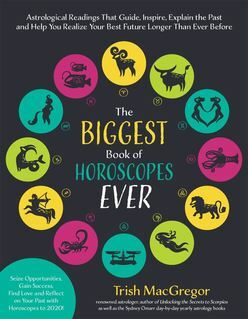 The wealth of information that Trish shares on the actual horoscopes, plus the detailed overview of astrology at the beginning of the book, will appeal to curious beginners as well. The biggest resource of horoscopes that spans the longest period curating the information found online or in other resources by covering three whole years for every sign.